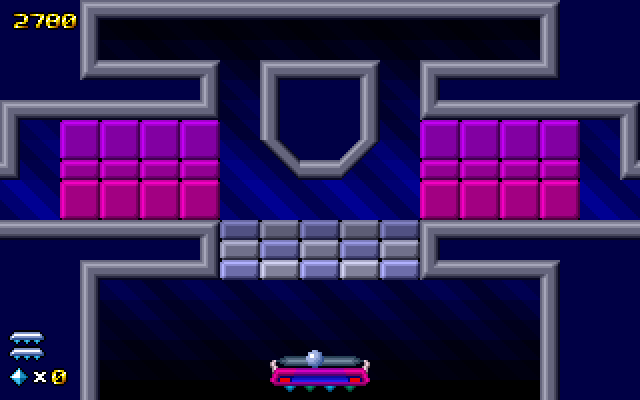 Breakout is one of the classic games that has lots of clones, some like Arkanoid are quite well known. 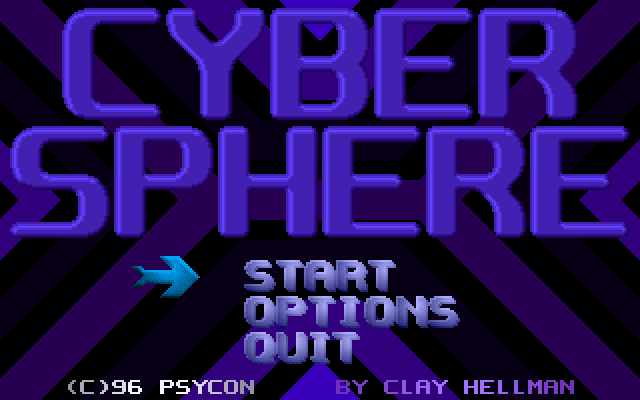 Today’s game, Cyber Sphere is one of these clones. Originally made in 1996 near the end of the DOS gaming era by Clay Hellman under the Psycon name. It is notable for having been written exclusively in x86 assembly, using OPL3 sound, and having irregular shaped play areas. Graphically it’s quite nice, it has a simple design consisting of blocks/stripes of solid colour that look really quite good when combined with the palette shifting animation. 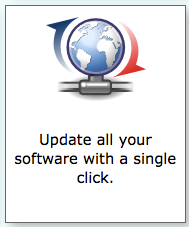 It is consistent throughout and has an easy to use menu system that gets you into the game quickly. The play area is similarly simple, but with more detail in the game play elements. The only real gripe I had was it was easy to lose a ball in a sea of power-ups or gems making it really hard to track. The sound design is also exceptionally polished. It makes excellent use of the OPL3 chip to produce some quite good music and sound effects. There are 9 music tracks, each with their own distinct sound. This is definitely a game to have the sound on for. Game play wise it’s obviously very similar to many other breakout clones, but there are a few things that set it apart. Firstly, the play area is often an irregular shape instead of filling the entire upper portion of the screen. Some of the walls are angled, reflecting the ball in ways I didn’t expect at first. 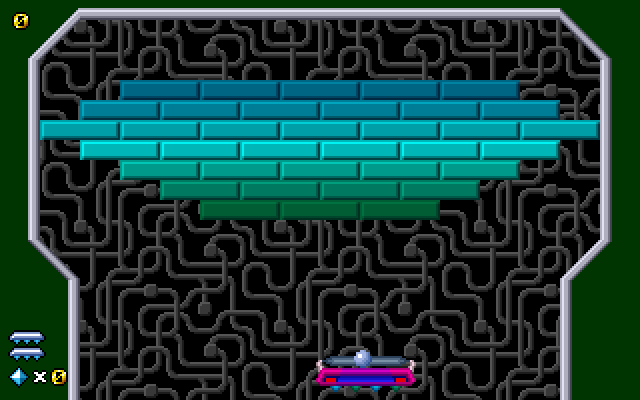 These angled walls sometimes make it easier to get the ball into tricky areas, or up around the back of blocks. The power-up system is fairly simple, each power-up has an effect such as making your paddle wider. 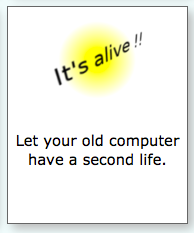 Collecting one the first time enables the power-up, but collecting one a second time disables if possible, meaning you should try to dodge power-ups you already have. Some such as the guard rail and extra balls can’t be disabled, so those are instead extended with more balls or longer time with the guard rail. 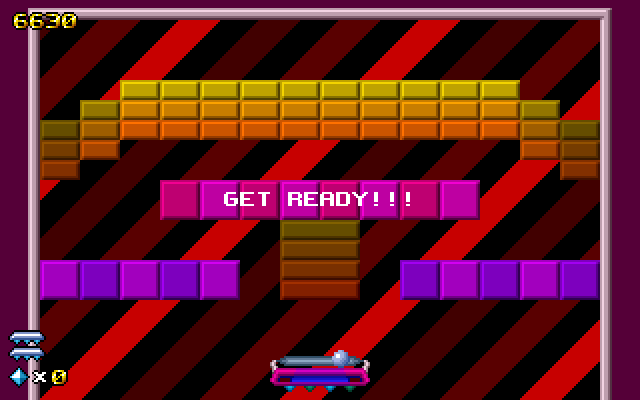 Collectable Gems also come out of broken blocks, and are there mostly for bonus points at the end of a level. You get 50 points for every gem collected at the end of the level, but you lose all your gems during a level if you lose a life. 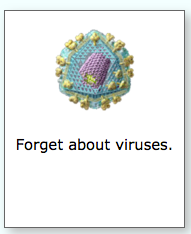 So it’s important to stay alive to get the bonus points for gems you collect. Unfortunately sometimes lots of gems are released by a block, making it extremely hard to see the ball. 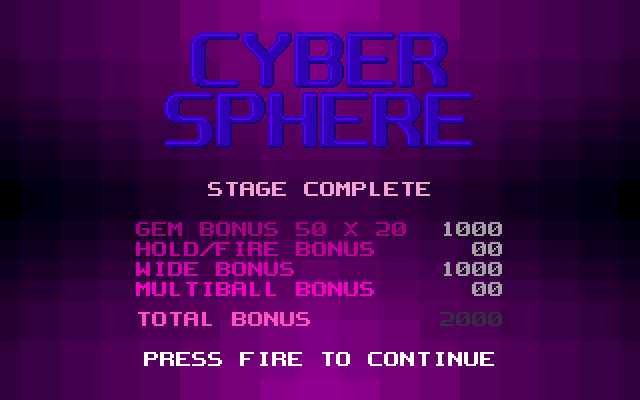 Cyber Sphere is very nicely polished, and despite not quite getting used to it I quite enjoyed my time with it. There are some downsides, such as gems obscuring the ball, and I also found the difficulty curve was strange. 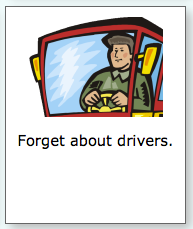 Some levels are much harder than others, with a few being hard enough to be a road block. However I didn’t really get frustrated as I could choose another sector to play, and the game is quite easy to jump into again. 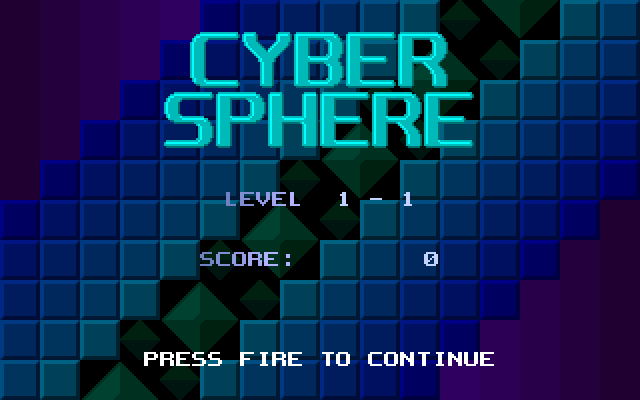 Cyber Sphere was released as freeware, so if you like Breakout games you should definitely try it out.